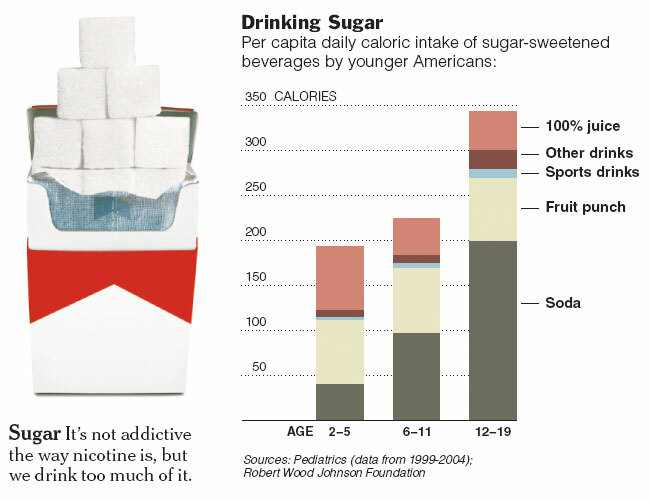 Sugar intake, especially in children, is a major US health problem. It is a major contributor to obesity and is creating an epidemic of diabetes in children, a disease once considered an adult problem. The soda industry, much like the tobacco industry in the 80’s, markets heavily to children knowing that if they can form the habits of soda drinking young, they will most likely have a life long costumer. While soda is not chemically addictive, although some would argue that point, it certainly creates dependency. It does so by setting up a dangerous process within the body by which a person can become dependent on the sugary surge they get from a soda to feel normal. Also consider that many sodas contain caffeine. This caffeine also have a profound affect on a person and can actually cause withdrawal symptoms just like a drug. The withdrawal symptoms can be very uncomfortable and include headache, fatigue, sleepiness, inability to focus and concentrate. Others report experiencing flu- like symptoms, irritability, depression and anxiety. The real problem of soda, however, is the sugar in soda. It forces the body to release a hormone called insulin in such large quantities that children quickly become insulin resistant and soon thereafter are diabetic. Soda creates a disease in children that used to take decades to develop in adults. These children are also overweight increasing their risk for just about every chronic disease ranging from heart disease to cancer. This places a huge financial burned on our health care system, driving cost up higher and higher. The way to off set this? Perhaps a soda tax is the answer. The Joint Committee on Taxation calculated that a 3-cent tax on each 12-ounce sugared soda would raise $51.6 billion over a decade. This is quite a lot of money. A 12 pack of Coke costs about $2.99 so that would up the price to $3.35. It certainly isn’t enough to stop people from buying their sodas, but it would provide some income to help fight the health problems it is causing. Proponents of the tax say the money would be used to fund a health marketing campaign to teach people how to eat healthy. This is a good idea only if they teach it correctly and disregard the whole low fat paradigm. Studies show that sugared beverages are the No. 1 source of calories in the American diet, representing 7 percent of the average person’s caloric intake and up to 10 percent for children and teenagers. You will notice sugared beverages are fat free! Maybe the beverage industry should start advertising that. The problem in this country is the carbohydrate consumption is through the roof. Teaching people about eating fat free is a terrible idea because it will only push people towards things high in sugar like soda. They are fat free after all! The marketing campaign needs to focus on low glycemic, low carbohydrate options. This is the only way to change the health picture in the US. We need to shift our paradigm and consider that fat is not the enemy. Carbohydrate is. Simple and refined carbohydrates cause disease and keeping them out of the diet is the single most important factor in long term health. When I put patients on a diet, I routinely ask them to look at the labels when they’re buying various products. It is not uncommon, however, that people aren’t very efficient readers of food labels. You know, that small black and white box of letters and numbers on the sides of food containers? The reason I ask patients to read these is because it contains valuable information on it. I like people to look at the carbohydrate content because this will be most reflective of whether it is a healthy food or not. Foods with high carbohydrate content and high amounts of sugar are obviously not healthful. After several months of reading labels it becomes very natural and you can actually begin to guess what the contents of certain foods are without even looking at the label. The problem though is that the current food labeling system can be quite confusing. There are a lot of people that don’t know what a calorie is. There are a lot of people that don’t know the difference between fat, carbohydrate and protein. There are a lot of people that don’t know that all three have profoundly different affects in the body when consumed. Learning these are of utmost importance for being able to understand the nutrition label. The definition of a calorie is a unit of heat equal to the amount of heat required to raise the temperature of one kilogram of water by one degree at one atmosphere pressure. Not helpful? Didn’t think so, but that’s the definition. Basically a food’s caloric content is measured using this definition and chemical process. When speaking of food calories we are actually talking about kilocalories because there are other caloric measurements. The basis of caloric measurements is based on gram calories or 1/1000 of a kilocalorie. If we used gram calories as the standard, food would contain hundred of thousands of “calories” and would difficult to calculate caloric content. So, kilocalories are used to measure food and the term -kilo is dropped from the word to give us simply a calorie. Calories are measured in a ‘calorimeter.’ A substance can be combusted (literally burned) in the presence of oxygen, to measure the amount of heat generated per gram. From such basic measurements, and by extrapolation to mixtures of different ingredients, the ‘calorie count’ can be applied as a measure of the energy derivable from a food source. Basically, what you need to remember is that a calorie is energy. We use the energy, or calories, from our food to survive. They allow us to pump blood, breath, think, etc. Without calories we cannot survive. What is Fat, Protein and Carbohydrate? These are considered the macronutrients and they contain different amounts of calories. Protein and carbohydrates both contain 4 calories per gram. Fat contains 9 calories per gram. Basically what this means is that any amount of fat contains a little more than twice the energy that the same amount of protein and carbohydrates does. Protein is used to do a lot of things in the body. It is used for cell signaling, cell structure, enzymes, neurotransmitters, muscle function and many other things. It supplies a small amount of energy when needed. It is very important. Fats play a vital role in maintaining healthy skin and hair, insulating body organs against shock, maintaining body temperature, and promoting healthy cell function. It is also a great energy source. They are also important in that they must be present to absorb the fat soluble vitamins which are vitamin A, D, E and K.
Carbohydrates are the most common source of energy in living things. Just because they are common, does not mean they are necessary for survival. There is no such thing as an “essential” carbohydrate. You can obtain all the energy you need from fats and proteins. There are, however, essential proteins and fats. So What’s Wrong with the Current Food Label? The current food label is confusing and should be set up a little differently. To see a great example of what it should look like click here and scroll to page 6. This is from the Center for Science in the Public Interest. There are some things that I agree with on this “new” label and some I do not. I agree that there needs to be clarification with regards to the amount of calorie in each serving. People often see 350 calories listed and can’t figure out how much food they can have for their 350 calories. On the new label clearly stating that there are 350 calories in one serving makes that a little easier. Secondly, the larger typing on the whole label makes it a lot easier to read. Thirdly, there are a lot of foods that claim they have whole grain content. At the top of this new label, companies would be required to tell you how much is whole grain. In this case, it’s a lowly 2%. I think that is a great idea because the food industry is getting away with marketing their products a whole grain when it fact they contain very little of it. I also like the red numbering and lettering letting you know that you should pay attention to what’s been highlighted. Although I believe they should highlight the total carbohydrate content rather than just the added sugar, it’s a good start. It’s lets people know they need to pay attention to these things because they are important. I also like how the major and minor ingredients have been broken down so you can see clearly what this food is actually made up of. Separating the ingredients by bullets and taking out all the capital letters is also very helpful. I have many patients with allergies and the allergy information at the bottom would be a life saver for these people. It’s a great idea to have it listed on every package. People need to take their own health into their hands and not rely on others to do it for them, but this is a great step in the right direction. Making the food labels easier to understand would probably help a lot of people manage their diets more effectively. Can What You Eat Cause Infertility? Apparently, the answer is yes. Recent research has shown that women who have celiac disease are much more likely to have trouble getting pregnant than women who are not gluten sensitive. Celiac disease is a genetic disorder in which gluten, the main protein found in wheat, is not properly processed. It causes an autoimmune reaction in the body leading to ulceration and inflammation in the gut. Symptoms include diarrhea, gas, bloating and fatigue. A person with celiac disease may be asymptomatic or may have very severe symptoms. Although wheat is the main offender, gluten is also found in rye, barley and oats. The reaction the body forms to gluten causes the lining of the small intestine to atrophy. This problematic because this is the portion of the digestive tract that is most responsible for absorbing nutrients. If you cannot absorb nutrients your body cannot thrive. Women with untreated celiac disease are more likely to have problems getting pregnant. They also will have higher incidences of miscarriage and premature births. Believe it or not, men will also have issues with fertility if they have celiac disease. There are also other problems associated with untreated celiac disease for women. Dr. Sheila Crowe, a professor in the division of gastroenterology and hepatology in the department of medicine at the University of Virginia lists the following problems. These menstrual problems cause a woman to ovulate less which results in a smaller chance of getting pregnant. Men may also have trouble with fertility as mentioned above. Dr. Crowe recommends that if you and your partner are having trouble getting pregnant, you should both be screened to see if celiac plays a role. Remember, you may not have symptoms and still have celiac disease. The test is a relatively simple blood test. Be sure to continue to eat gluten throughout because if you go gluten free before the blood test it may not show up. If the blood test comes back positive, a tissue biopsy may be performed to confirm the diagnosis. The pathologist will look at the cellular lining of the small intestine to confirm that there is in fact atrophy. Treatment for celiac is relatively simple. Avoid gluten. This is becoming more and more common place and grocery store chains are starting to carry more foods that are gluten free. A simple diet change is enough to solve this problem. A large portion of carbohydrate products are made from grain. The most common grain used is wheat and wheat contains large amounts of gluten. I am huge proponent of low carbohydrate diets for overall health. While celiac disease might cause auto-immune reactions that disrupt fertility, obesity is also a known risk factor for infertility. Women who are obese are 43% less likely to conceive a child than normal weight or even overweight people. If you think about this in terms of evolution it makes sense. A woman who is obese is less likely to survive child birth because of the strain it puts on the body. It is not unreasonable to assume that the lower rates of pregnancy in obese women is some sort of protective measure, evolutionarily speaking. Research has shown that low carbohydrate diets are more effective for losing weight and improving measurable health outcomes over the traditional low fat diet. See our old post. If you are having trouble conceiving a child and you are significantly overweight you should try losing weight and possibly think about getting tested for celiac disease. These are efforts you should undertake before considering fertility treatments. via Vital Signs – Afternoon Naps Can Increase Ability to Learn, Study Suggests – NYTimes.com. This truly is good news! The fact that napping is good for the brain was something Dr. Carrie and I were sure was true while we were in chiropractic school. We had class from roughly 7 AM until 3 or 4 PM with an hour for lunch and an hour for club meetings. These meetings were generally academic in nature, so the class load was quite high. We took every chance we had to get some extra sleep because we were often up late studying and needed to get up early to be at class by 7. We did not, however, have 90 minutes to sleep. More like 20….or 30. The naps did help when we had the chance to get them and know we know why. This study shows that neurons in the brain need rest just like a muscle needs rest to function at its best. This is something I routinely tell my patients when they are rehabbing their brains. I specifically tell them not to perform their exercises when they’re tired or hungry. Neurons that are fatigued or do not have enough energy supply are more apt to fail and cause more problems. Getting to bed at a regular hour every night and waking at a regular hour every morning. This helps to maintain the natural circadian rhythm of many of the hormones in the body. Sometimes when these hormones are disturbed, sleep becomes difficult. Keeping at much light out of your bedroom as possible. No one should have a television in their room. I know many patients use it to “fall asleep” but it is not an effective tool for most. Even the light from your alarm clock is enough to stop the production of the neurotransmitter melatonin. My suggestion is to take a magazine or a small piece of cardboard and cover up the light coming from the clocks in your room. The darker the room the better. Avoiding things that might disrupt sleep like alcohol and caffeine before bed. Caffeine is a stimulant and there’s a reason people drinking it when they wake up. Alcohol, a depressant that usually makes people sleepy, has a rebound effect that can actually wake you 2-4 hours after you go to sleep. It is not an effective way to manage insomnia as some people use it for. Lose weight if you need to. Being overweight increases the risk of sleep apnea, a sleep disorder that causes a person to stop breathing at night. This cessation of breathing can cause a person to wake up unknowingly, sometimes hundreds of times per night. If you know you have sleep apnea, get a CPAP machine. CPAP stands for Constant Positive Airway Pressure. Basically the machine keeps you throat open so air can pass uninterrupted into your lungs. Of course if you need to take a nap and you have the time, indulge yourself! It is good for your brain. But remember the nap should supplement your positive sleep habits and should not serve as a replacement. A recent story published in the NY Times tells the story of Dr. Steven E. Nissen, a cardiologist at the Cleveland Clinic. He conducted a large study of the diabetes drug, Avandia. His conclusions in the study were not favorable for the drug or the pharmaceutical company, GlaxoSmithKline, that produces it. There is quite the controversy over the drug because of the dangers it poses to patients who take it and because of the cover-up that has ensued from GlaxoSmithKline. Now more evidence of crooked behavior on behalf of executives from GlaxoSmithKline. Dr. Nissen conducted a landmark study that suggested that the best-selling diabetes drug Avandia raised the risk of heart attacks. The study led to a Congressional inquiry, stringent safety warnings, a sharp drop in the drug’s sales and a plunge in the share price of GlaxoSmithKline. The battle between GSK and Dr. Nissen was kept professional and legitamate until May 10, 2007, 11 days before his study was to be published in the New England Journal of Medicine. Dr. Nissen was set to meet executives from GSK about his upcoming study and was nervous. In my opinion, rightly so. There are many published reports of powerful pharmaceutical companies trying to suppress scientific information that is unfavorable and ruining the careers of researchers who are only trying to do what’s best for the public. He was so nervous, in fact, that he decided to record the encounter. The amount of lying from the executives in this meeting is astounding. For example, executives in the meeting repeatedly said they would immediately begin a new analysis of the safety of Avandia. Three years later this study has yet to be published. They did, however, release the results of this study on their website, which of course were favorable for the drug. The fact that it has not been published means that it doesn’t hold up under peer review and was most likely an attempt to look like they were doing the right thing all the while making sure the numbers looked good too. It is an underhanded way of trying to get data to the public without the rigors of peer review. “Also during the meeting, Dr. Ronald L. Krall, GlaxoSmithKline’s chief medical officer, predicted almost exactly the results of another crucial study of Avandia that was two months from publication and whose results, according to scientific protocols and the company itself, should have been kept secret from the company. In an interview, Dr. Nissen said the recording showed that the executives hoped to persuade him not to publish his study by suggesting that they had contradictory information they would share with him in a joint study. GSK said in response that they were not aware that Dr. Nissen was recording the interview and were disturbed that he did so without telling them. It’s probably a good thing that he didn’t tell them because it would have changed the entire meeting and we wouldn’t have this window into just how corrupt Big Pharma is. GSK was sued in 2004 by the State of New York for not publicizing the results of studies that showed antidepressants led to an increase in suicide in teenagers. The settlement of the suit required GSK to post the findings on the internet. This crooked behavior was what fueled Dr. Nissen to record his meeting with these executives. During the meeting the four executives spoke as if they were unaware of the results of the study Dr. Nissen has completed. It was clear they were lying about this as well because one week before the meeting these executives were faxed a copy of the study secretly and inappropriately. This was only later found out by Congressional investigators. Who would do something like this? A journal reviewer who also worked as a consultant for GSK. That’s right. The very same people who are supposed to review our literature and make sure it is accurate and without bias also work for Big Pharma. Talk about a conflict of interest. At one point, the executives said that studies showed that Avandia had no impact on cardiac death rates. This is a fact they unequivocally knew was not true. Dr. Nissen’s study had concluded that the risk was increased by 64 percent. They then, again, spoke as if they did not know the results of Dr. Nissen’s study, which Congressional investigators have shown they did. “I get different numbers on this, but we’ll talk about it later,” Dr. Nissen said. “This is one that is important to us,” Dr. Krall concluded. Dr. Nissen was clearly tired of the push he was getting because it was clear they wanted him to forgo publishing the study. He’d had enough. Internal emails obtained by the Congressional investigation show that they company was well aware of the dangers of the drug despite what the executives were saying in this meeting with Dr. Nissen. GSK has responded to Dr. Nissen’s study calling it flawed and with some serious limitations. They are saying these things even though their own studies have come up with similar numbers. This is entirely about the money that Avandia brings in for the company. Although its sales have dropped dramatically, it still made $1.9 billion last year. These executives, while MDs, and PhDs, ceased to care about the public the day their jobs became to get money into the pockets of their shareholders. And pulling a drugs that has been as successful financially as Avandia certainly will not endear them to the board members that make the decisions about their careers. I will leave you with this. Thousands of people per year have unnecessary heart attacks and die by taking this drug, yet the executives at GSK want to cover up this evidence just to make more money. To me this is not just a failure of our regulation of drugs and the FDA, but also of health care in general. If “mainstream” doctors just understood more about nutrition and actual health and weren’t so quick to prescribe medication for a disease which, by all accounts, is most easily and successfully treated with diet and exercise, we wouldn’t be in this mess to begin with. A new study shows that drinking as little as two sodas per week significantly increases your risk of pancreatic cancer. Pancreatic cancer is dangerous because it is aggressive. There are usually few symptoms until the cancer is advanced. Symptoms include abdominal pain, weight loss, diarrhea, and jaundice. People who drank two or more soft drinks a week had an 87% increased risk — or nearly twice the risk — of pancreatic cancer compared to individuals consuming no soft drinks,” says study lead author Noel T. Mueller, MPH, a research associate at the Cancer Control Program at Georgetown University Medical Center, Washington, D.C. The study is published in Cancer Epidemiology, Biomarkers & Prevention, a journal of the American Association for Cancer Research. I am sure you will be surprised to know that they beverage industry took exception to this study calling it flawed and poorly designed. The study, however, was quite comprehensive. It looked at over 65,000 people and followed them for 14 years. The researchers hypothesized that the increase in cancer was as a result of poor insulin control. Drinking sugary sodas causes massive amounts of insulin to be released by the pancreas. Insulin, while a vital hormone needed to maintain life, is detrimental in excess. It’s already the main culprit in obesity and diabetes and has been linked to Alzheimer’s disease. Now researchers hypothesize it may increase the risk of pancreatic cancer. There are other studies that show a positive correlation between intake of high fructose corn syrup, the main sweetener in soda, and pancreatic cancer as well. These numbers are mind boggling. The average person drinks 600 12 oz. servings per year! You have to remember that takes into account the people who don’t drink any soda because it is an average. I never drink soda so for that number to be that high, there has to be a lot of people drinking a lot of soda. Males aged 12-29 drink 160 gallons per year or 2 quarts per day. To put that into perspective, that’s just over 5 sodas per day. This study says that as little as two sodas per week is enough to significantly raise pancreatic cancer risk. The soft drink industry is a large reason that this country is so unhealthy. Most people do not realize the amount of sugar in a soda. There is more sugar in one soda than in 1 bag of M&M’s. Most parents would not let their children it 5+ bags of M&M’s in a day but don’t think twice about letting them drink soda all day. One with breakfast, one with lunch, one with dinner and a couple in between for snacks and pretty soon a whole six pack of soda is gone. Good thing it’s cheap. That is also part of the problem. The availability of inexpensive soft drinks makes it that much easier to get. But here’s the funny thing – water is much cheaper! If people replaced their soda intake with good, clean, healthy water many of the health problems in this country would evaporate. Do yourself a huge favor; if you drink soda, stop. I have had many patients with health issues and cutting out the sugary drinks is a must. The soft drink industry would have you believe you can be a healthy individual and enjoy soda, but it isn’t true. Just like the tobacco industry used to tell you smoking in moderation wasn’t bad for your health, the soda industry will continue to perpetuate the lie until they are forced to change. Even if we forget about all the other bad aspects of soda – the acidity, the preservatives, the additives – and just consider the sugar, it’s a dangerous product. Don’t drink it if you value your health or your family’s health.